Streaming giant Netflix seems to be planning to allow viewers to make decisions that affect the storylines of certain shows. That’s according to Bloomberg, which reported on Monday that the company is planning a push into interactive television that will present viewers with decisions about what should happen next during an episode, like a branching “Choose Your Own Adventure” novel. The project would be a bold experiment in storytelling for Netflix. The company has reoriented the TV industry around online streaming in ways that reportedly terrify traditional networks. It’s mostly stuck with the classic linear formats of TV and movies — until now. Netflix hasn’t formally announced its interactive shows, and the Bloomberg report is based on an anonymous source (though allowing someone to speak to the press on background might just be a way to drum up buzz for the new series). But we turned up a little something that makes us think the new series are totally happening — a page on Netflix’ help site that appears to describe the upcoming interactive content. It’ll work on most platforms, it says, but not Chromecast or Apple TV. Bloomberg pointed out that Netflix has already test-driven the technology on the kids’ show “Puss in Book.” That show presents viewers with simple choices, like who the title character Puss should fight, but Bloomberg’s sources said in adult programming (likely to drop before the end of the year), the branches will be more complex. 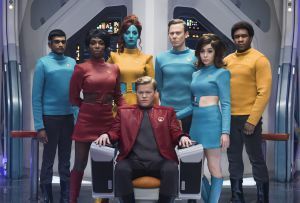 One of the first adult titles that will let viewers make decisions will be an episode of the dystopian technology show “Black Mirror,” according to Bloomberg’s sources. That feels pretty on the nose. Netflix has perfected the art of roping viewers — even children — into binge-watching sessions. Interactive shows might be an exciting new method of storytelling, but there’s no doubt the interactive shows are just another way to keep us all watching.